Alongcamepollly: Come On You Girl In Green..
First off, I apologise for my complete lack of posting in the past week. (Teresa-look I'm back!) I only have myself and a few sleepless nights to blame. But, fear gone, fresh head, it's onwards and upwards! If my writing is a bit scratchy today I'm sorry it might take me a little while to warm up again! I have a few outfits to post, so I'll begin with Monday, I went to Dublin for the day to see my sisters with my brother. It was horrendous getting up so early after Sunday night but a great day nonetheless! 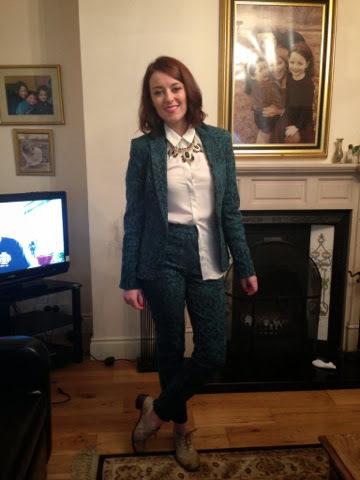 I bought a green jacquard suit in Penneys the second I saw it I loved it. The strange thing is I hate matching accessories, e.g. shoes and bag, or subtle colour themes, but I love head to toe one colour, or everything matching in the one print. So this suit was perfect for me. The quality is great it's a stretchy thick material, very comfortable to wear. 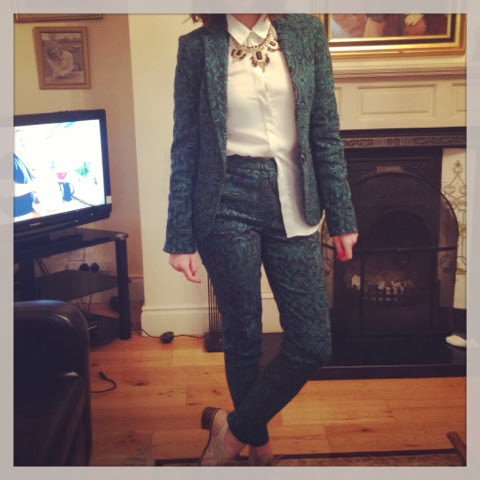 The pants are €17, and the blazer is €25. The forest green print is the perfect colour coming in to autumn/winter and both pieces are easily worn with anything else in your wardrobe. I wore a white shirt, also from Penneys €10, and a chain from there under the buttoned up collar. When I'm wearing a shirt I always do the 'half-tuck', it's something that has caused people to stop me on the street saying 'sorry, but your shirt is coming out at the side there'- yes I'm aware, thank you. But I just like the look of it instead of the usual full tuck. It's also great if you feel bloated because it covers you up a little bit and keeps you looking stylish. 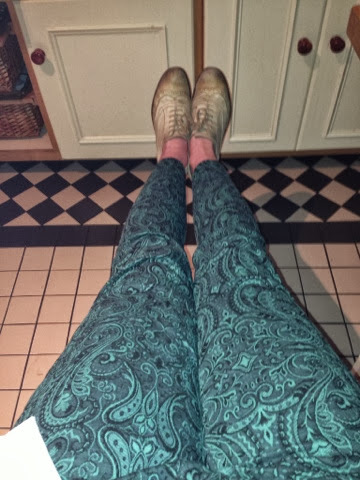 The shoes are brogues, I was going to wear the Rockstuds but seeing as I was walking like a baby lamb with tiredness I decided I better not. When I was in Dublin I wasn't in the mood for shopping at all but I did pick up two great buys in h&m. 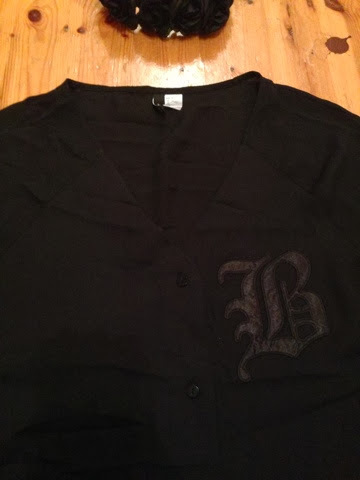 I got a black baseball style top which is very simple but can be worn with anything and is perfect for work. I also got a pair of leather leggings. I have been on the hunt for a good pair for ages now that were a matte-style leather that didn't cost me an arm and a leg, so these are perfect. 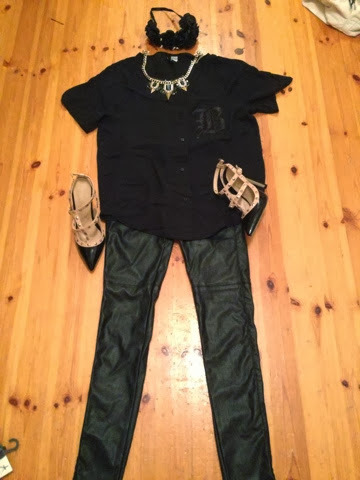 Top €15, leggings €20 h&m.